MEG X299 CREATION comes with a unique look and feel inspired by the concept of element explosion. Packed with exclusive features to unleash the overall performance for incredible multiple cores CPU. Tailor-made for designers and content creators, the features and design perfectly meet the demanding requirements for creating your own masterpiece. Multiple fan connectors and thermal sensors allow you to set up a cool & silent system through automatic or manual control of your FANs. • 1x All In One Pump Header. • 1x CPU Fan Header. • 6x System Fan Header. • 1x Extension Thermal Header. World’s fastest SSDs can start to lower performance when getting hot. Part of the motherboards heatsink design, M.2 SHIELD FROZR is the next generation M.2 thermal solution to avoid this by offering the best thermal protection to make sure that SSD maintains maximum performance. • Higher maximum SSD speeds. • Keep Out Zone: MSI motherboards circuitry ensure the case standoff keep out zones are pure and clean, preventing any component contact or damage to the motherboard. • XL Clip: The enlarged PCI-E clip helps you swap or remove your devices easier. Keep the PCI-E slot stronger and safer. • Easy Button 3: This motherboard features accessible physical buttons for instantly resetting and powering up/down your system. The buttons are illuminated so you can easily spot them in a dark environment. • DeBug LED: Run into trouble? The digital LED display will indicate the source of the problem so you know exactly where to look to get up and running again. • EZ DeBug LED: Run into trouble? On-board LEDs for key components will indicate the source of the problem so you know exactly where to look to get up and running again. • Clear CMOS: Helps to restore the BIOS default settings which helps in 99% of the cases to successfully boot again. • Dual BIOS: Having 2 physical BIOS chips allows to have a plan B.
MSI X299 motherboards perfectly support latest Intel® Core X-series processors. Combining MSI Core Boost technology, you can release maximum performance no matter what CPU you use. • Gaming Mode: MSI Gaming Mode provides the most suitable setting for your whole gaming system, bring you the best gaming experience with one click! • Game Boost: Need more power from your CPU and memory to get more FPS? MSI Game Boost enables one-second overclocking, giving you the performance boost you need. • Gaming Hotkey: Easily program your most-used commands and execute them with a single keystroke. You’re free to choose any key you want, so choose wisely. • USB Speed Up: When enabled, it optimizes your devices for even better transfer speeds and can provide up to 20% increase in USB performance, saving a lot of time when transferring data. • OC Setting: With an intuitive interface, OC Setting allows you to tune settings to increase system stability, maximize performance and optimize your system’s cooling features. • Total Fan Control: Total Fan Control allows you to take control of your fans. You can also set up to 4 temperature targets for CPU and motherboard, which will adjust the fan speeds automatically. • VR Ready: A single click sets all your key components to their highest performance and makes sure other software applications won’t impact your virtual adventure. • Live Update: Never miss out on important updates. MSI Live Update automatically downloads and installs the latest drivers, BIOS and software so you can focus on your game. We made sure our BIOS contains all the latest options and is easy to use for everyone. The extensive features let you fine-tune your system to deliver reliable maximum performance. • Game Boost: Safely overclock your CPU with a single button for more performance. • XMP: Extreme Memory Profiles which simplified RAM overclocking on Intel motherboards. • M-Flash: Allows user to conveniently flash, or upgrade the BIOS from the CMOS Setup Utility. • Hardware Monitor: Shows you critical hardware information in real-time; temperature, usage, clock speed, and voltage. • Total Fan Control: Check and manage speeds and temperatures for all your system and CPU fans. • Secure Erase+: Using an optimized formatting algorithm, lets you enjoy your SSD at maximum speed, making your system feel brand new! • Memory Try It: Best way to get maximum speed out of your system memory and gaming performance. • M.2 Genie: Brilliant feature to make setting up RAID 0 for M.2 and U.2 much easier and less time consuming. • Search & Favourites: A permanent search & favourite option in the top right corner can be used to find what you need. The XMP (Extreme Memory Profiles) in MSI BIOS are tested and certified by MSI OC lab. It is easy to enable with auto power settings to get the best memory speed and stability. • 1x 32Gbps U.2 Connector. • 3x 32Gbps M.2 Slots. • 8x 6Gbps SATA Ports. 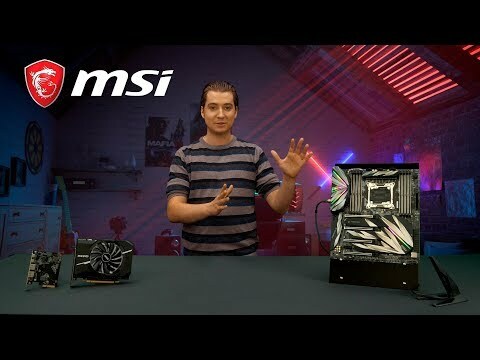 You can find Triple Turbo M.2 with Shield FROZR on the MEG X299 CREATION. In addition, another exclusive accessory can be found in the packaging: the M.2 XPANDER-AERO. This PCI-Express card offers four extra M.2 slots to increase your storage capacity at maximum speed. Featuring auto detect function for the M.2 access and the M.2 temperature for easy checking, by including M.2 activity & M.2 smart Fan temperature detection LEDs. The Intel Virtual RAID on CPU, VROC, unseals the PCIe lanes direct from processor in order to configure a bootable RAID array, rather than the 32Gbps DMI bottlenecks from chipset. With the Intel VROC, you can take advantage from the full speed SSD device during game loading. Build the prompt OS disk with 4x more Turbo M.2 devices in RAID 0 from processors directly. *Please note that you will need the VROC upgrade key for full function when 90-day trial period has expired. This great little tool is very simple to use and automatically detects your storage devices connected to the system. When enabled, Storage Boost optimizes your SSDs to keep your system fast and maximize storage performance, saving you a lot of time when loading or transferring data. Looking to go all out in terms of raw data speed and put multiple SSDs in RAID 0? Setting this up can prove to be quite the challenge. That's why we created M.2 Genie, a brilliant feature to make setting up RAID 0 for M.2 and U.2 much easier and less time consuming. Read and write your files over USB faster than ever. MSI offers a wide variety of options to connect and boost your USB devices, delivering lightning-fast transfer speeds up to 10Gb/s. A great designer can’t do anything without professional equipment, MEG X299 CREATION featuring Lightning USB, Front Type-C 3.1 gen 2 and tons of USB 3.0 / 2.0, providing excellent performance for your multiple devices. MEG X299 CREATION features high-bandwidth and low-latency dual Ethernet networks for demanding creators and power users. On-board 2.5Gbps connectivity provides incredible data transfer speed faster than ever before. MSI LAN Manager automatically classifies and prioritizes the latency-sensitive for your applications, giving you the best online experience with low latency. This model comes equipped with a premium network solution from Intel®. The high quality Gigabit LAN networking component is optimized for professional and multimedia use with outstanding performance to deliver a secure, stable and fast network connection. This next-generation Intel® Wi-Fi / Bluetooth solution uses smart MU-MIMO technology, delivering AC speeds up to 1.73Gbps without any cable limitation. MEG X299 CREATION features exclusive expansion card, THUNDERBOLT M3. Offering dual DisplayPort and dual Thunderbolt 3 for the full 4K video experience, accelerate content creation workflow and team productivity with the ability to move massive files, images and video unrivalled for new uses Daisy-chain connect up to 6 Thunderbolt™ devices with a single wire speeds 8X faster than USB 3.0. Tailor-made for designers and content creators, the features and design perfectly meet the demanding requirements for creating your own masterpiece. MSI Mystic Light provides a complete function to control the RGB light all around the ecosystem. Select the available colours from the palette to match your favourite and mood. MSI Motherboard offers multiple colours and variety effects for you to set up the whole rig by your own way. Still not satisfied with the decoration on the ecosystem? The Mystic Light Extension will help you to have more attractive way to decorate you gaming rig by the LED Strips and still under controlled by the Mystic Light application. The JRGB pin header provides the max 3A(12V) power supply for the up to 3 meters 5050 RGB LED strips showing single colour. MSI Mystic Light SYNC built with open SDK for all the peripherals. With Mystic Light application, you can easily control all the colour and effect in one application. Using only the finest quality components and integrating the latest technological innovations delivers the best possible professional experience. Rigorous quality testing under the most extreme conditions ensures a super reliable, long-lasting and high performance motherboard. Features • Supports Intel® Core™ X-Series Processors Family. • Supports DDR4 Memory, 8 DIMMs, Quad Channel Max Frequency DDR4-4200+(OC). • Maximum Power: 13+1 phases digital power with heat-pipe heatsink design. • Maximum Data Transfer: 2.5G LAN + Intel® Gigabit LAN with Intel® WIFI and bandwidth management. • Maximum Storage: 7x Turbo M.2 with M.2 XPANDER-AERO. • Maximum Temperature Control: Full fan control with 8 PWM fan headers and 1 dedicated thermal sensor. • Core Boost: With premium layout and full digital power design to support more cores and provide better performance. • Triple 8 Pin Power Supply: By providing triple 8 pin connectors to ensure adequate power supply to unleash ultimate multi-core CPU performance. • Audio Boost 4 with NAHIMIC: Reward your ears with studio grade sound quality. • DDR4 Boost with Steel Armour: Fully isolated, shielded and optimized DDR4 PCB design to give your DDR4 memory a performance boost. • Multi-GPU: With Steel Armour PCI-E slots. Supports 4-Way NVIDIA SLI™ & 4-Way AMD Crossfire™. • Thunderbolt3: Exclusive expansion card offering dual DisplayPort and dual Thunderbolt 3 for the full 4K video experience.